The government collected Rs 90,669 crore goods and services tax (GST) for August, a little lower than the Rs 94,063 crore collected in July. This is also lower than the Rs 91,000 crore which should have come to the Centre and states in a month, given the Budget Estimates and assumed growth rates in receipts for 2017-18. Only 55 per cent of assessees paid taxes for August, compared to 64 per cent for July. But, the figures should be compared cautiously. About Rs 92,283 crore GST was collected for July till August 29, while Rs 90,669 crore was garnered till September 25. Hence, growth in collections was flat in August, compared to July. As much as Rs 94,063 crore was paid till August 31. 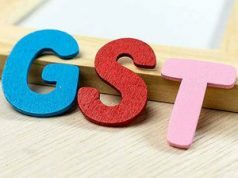 About Rs 14,402 crore came from the Central GST (CGST) in August, against Rs 14,894 crore in July (paid till August 29); Rs 21,067 from State GST (SGST), against Rs 22,722 crore in the previous month; and Rs 47,377 crore from Integrated GST (IGST), compared to Rs 47,469 crore in July. 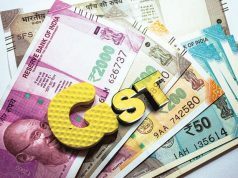 Of the IGST, Rs 23,180 crore came from tax on imports, against Rs 20,964 crore in July, according to figures released by the finance ministry. The cess over the peak rate of 28 per cent garnered Rs 7,823 crore in August, from Rs 7,198 crore in July. Of the August amount, Rs 547 crore came from cess on imports. The cess will be used to pay states that suffer losses because of the GST. Taking a broad look at the numbers, it is clear that two figures — the IGST on imports and cess collections were higher in August. This means imports in the month were higher than in July, and items that draw cess, such as aerated drinks, cigarettes, cars, and coal, were sold more, at least in value terms. Merchandise imports of $35.46 billion were made in August, against $33.99 in July, according to trade figures released by the commerce department earlier. These are gross figures, as such it is very hard to assess how much would be net collections for the exchequer as claims for input tax credit are not given. As much as Rs 65,000 crore of credit for pre-GST stocks were claimed in July, but the government said only Rs 12,000 crore of claims were valid. “The collection has dipped marginally as assesses start to utilise their transitional credit. As industry settles down to the GST law and compliance, a more realistic collection figure will be seen in the coming months,” said Bipin Sapra of EY. 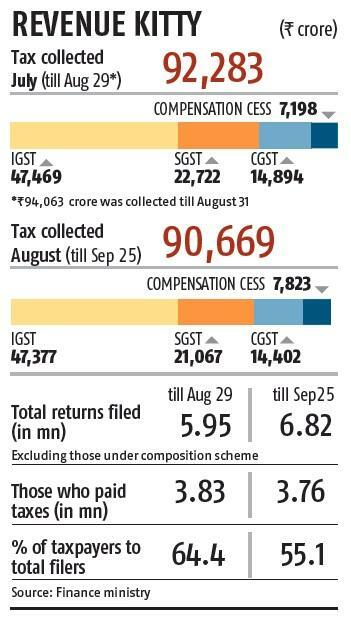 Ideally, the tax figures in August should be more than July as there were more returns filed last month. But those collections may come later. If those who paid taxes till August 29 and till September 25 are compared, the figures are more for the former month. The total number of taxpayers, who were required to file monthly returns for August was 6.82 million, of which 3.76 million filed returns (as of September 25). Over three million taxpayers are yet to file returns. 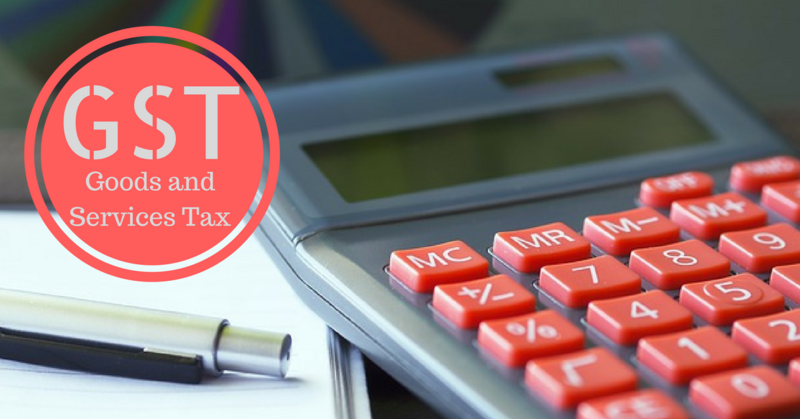 There were 5.95 million registrations under the the GST in July, of which 3.83 million filed returns as of August 29. This also raises the issue of compliance. “The alarming fact which emerges is with respect to the level of compliance for the month of August. It appears that 45 per cent of the assesses have still not filed returns (against 35 per cent for July). 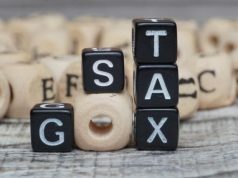 The government should go to the root cause and analyse whether these assesses are facing some genuine problems or they have been migrated automatically and are not required to comply,” said Abhishek Rastogi of Khaitan & Co.
Extrapolating the targets in the annual Budget, the central government’s August tax revenue should be Rs 48,000 crore. Against this, Rs 49,680.5 crore (Rs 14,402 crore from the CGST, Rs 23,180 crore from the IGST on imports and half of the remaining IGST at Rs 12,098.5 crore) came to the central kitty before devolution to the states. However, this is a broader number as division of the IGST is a complicated exercise. Assuming 14 per cent growth each in 2016-17 and 2017-18 to the 2015-16 revenues of states, their tax kitty should have been Rs 43,000 crore for the month. The growth rate is taken according to a formula of compensating loss-making states. Against this, states got Rs 40,919 crore, including cess, in August. The total combined targeted kitty was Rs 91,000 crore.